I’ve had UK nuclear issues on my mind a lot recently—all sparked off by my Barcelona talk, I guess. Preparing for that talk, I spent a lot of time reading the transcript of the House of Commons Defence Committee’s enquiry into the replacement of the Vanguard SSBNs. One aspect of the debate that interested me was whether effective deterrence relies on one submarine being at sea at all times. The UK currently has one launch platform for nuclear weapons: the Vanguard-class SSBNs (of which there are four). In its White Paper, the government assessed that the service life of these subs could be extended by five years. If correct, the second boat, HMS Victorious, would go out of service in about 2024 and, from this point onwards, it would no longer be possible to maintain continuous-at-sea deterrence (CASD). Given the Government reckoned it would take about 17 years to get the first boat of a new class up and running, it sought Parliament’s permission to start design work in 2007. At the time (as Jeffrey blogged) there was a debate about whether the service life of the boats could be extended by more than five years. I argued in Barcelona that it is impossible to know the answer to this one on the basis of unclassified information—and that this is another reason why we need some form of classified peer review (like the Jasons) in the UK. Of course, we’ve heard a lot about gaps before. During the 1960 election campaign, the Kennedy campaign famously spoke of the non-existent “missile gap” (OK, yes, it did exist but it turned out to be the US’ favour). The Nixon administration needlessly worried about a “window of vulnerability” occurring at some point in the 1980s (I notice Pavel Podvig has an article on this in the most recent International Security). And, let’s not forget the “mineshaft gap” in Dr Strangelove. Anyway, back to Trident. Justifying the need for CASD, then-Secretary of State for Defence, Des Browne said “the fundamental answer… is because continuous-at-sea deterrence is at the heart of having a credible deterrent.” Browne’s concerns must be premised upon an adversary hell-bent on threatening UK vital interests appearing suddenly—before the UK had a chance to revert back to CASD. First off, this is exceedingly unlikely. But, for the sake of argument, let’s accept that it just might happen. Would this enemy be more likely to attack the UK if it knew the UK no longer had a policy of CASD? Abandoning continuous-at-sea deterrence does not mean announcing to the world that you only have SSBNs deployed when there is a letter “r” in the month. The dates and the length of deployments would remain secret, regardless of whether CASD were maintained. As someone that broadly subscribes to the idea of existential deterrence (see Jeffrey’s excellent recent essay on the subject), I tend to think that any adversary who can be deterred will be deterred, if any remotely plausible threat of nuclear retaliation exists. The fact that abandoning CASD would mean that the UK could “only” nuke an enemy at short notice 50% or 75% of the time would surely be unlikely to alter that adversary’s calculation in any material way. Browne also defended CASD in terms of the need to “avoid unnecessary escalation in a crisis”. But, again, this argument would only hold if the Royal Navy were to advertise the deployment of a submarine—which it wouldn’t. The UK already has a pressing need to keep the deployment of a SSBN absolutely secret (so it cannot be tracked leaving port). Nothing would change if CASD were abolished. …it drives a real ethos into the programme and I do not think you can put a value on that. You have to be part of it to understand it. The maintenance of continuous-at-sea deterrence and the demands it places on the system and the tests it places it on the system are of real value. It drives operational preparedness, it drives crew training, it drives the whole way the team operate. I do not know how you value such a thing as ethos but I think it is absolutely pivotal to the way we have run this programme and would wish to continue to run it. In other words CASD is really about training and moral. These are, of course, not bad reasons for maintaining CASD. I’m not entirely convinced by the training argument since presumably the UK could build a realistic Vanguard simulator, if it does not have one already (I’m not clear on whether it does). But, having no experience of life on a submarine myself, I accept the Admiral’s argument that morale would be hit if CASD were abandoned. The question is ultimately whether morale is enough of a reason for keeping CASD. For me, abandoning CASD would be a real, meaningful step toward the NPT’s disarmament obligation (and the pretty much unanimous view in Whitehall is that this is crucial to building a coalition to prevent proliferation). It also would help lessen the political-military salience of nuclear weapons and further reduce the (already slim) chance of a catastrophic accident. Morale does matter but surely the political benefits of abandoning CASD matter more. Let them continue with CASD, just leave the warheads at home (at least on one or two of the subs — it can be a secret which ones). Or they could use one of my special patented Mexican pinata warheads if they really need realism. You don’t mention survivability anywhere in your analysis, except in noting that “the UK already has a pressing need to keep the deployment of a SSBN absolutely secret (so it cannot be tracked leaving port).” But, would it not be obvious to someone watching the base (either by satellite or on the ground) if all four subs were in port? I’m asking because I really don’t know what the base or the piers looks like. I do know that Tridents in the U.S. are not submerged in port, and, therefore, are visible, and vulnerable to an attack on the port. For the U.S, during the Cold War, the whole point of keeping some subs at sea was that this would enhance their ability to survive attack, whether or not they were going to shoot promptly or at a later time. So, when I read Des Browne’s comment that “continuous-at-sea deterrence is at the heart of having a credible deterrent,” I hear a survivability argument, not a prompt response argument. isn’t the point also that having the sub out at sea means that regardless of the state of the uk (eg: if hit by a huge nuclear strike), there will be retaliation (ie: MAD)? if subs are sometimes all in port, any such massive strike is going to be targeting all important military sites in any case, surely, so that from the uk gov. point of view, without casd they could not guarantee any retaliatory capability? a much more limited strike, such as from a rogue state or non-state entity, is unlikely to cause sufficient damage that the uk won’t have either sufficient nuclear or conventional force to respond – that suggests the whole point of casd is still very much cold war thinking vs. a soviet-type enemy. as for watching the port i believe it is faslane in scotland (chosen for geography so subs can go into the north sea / atlantic easily) and it is pretty well guarded, not sure about whether satellite observation can detect any secretive comings and goings (one would suspect this has been already considered by the navy …) but there are another piccies on the web of subs on the surface entering/leaving the base. Who in their right mind could ever imagine a Prime Minister of the UK ordering a nuclear second strike? A variant of this question is if continuous underwater cruise capability is necessary? If the current Vanguard-class SSBNs were limited to mostly surface travel, or stationary seabed positioning, (still CASD) would that be sufficient deterrent? The major life-extension problem beyond 25-years appears to be the reactor. The Vanguards already have backup diesels and limited battery power I believe – the get me home capability. Could this be enhanced with modern batteries (and maybe snorkel) to give a limited speed mobility and underwater operation capability with the reactors closed down? They would probably then have to operate not that far offshore from the UK. I have seen no discussion of this possibility. Maybe it is impractical, and I’m sure the navy and UK submarine builder would not like it. But it does seem perhaps worthy of some consideration. The deterrent would be less effective against Russia if it returned to following SSBNs out of port, but against less capable Navies it seems still a very effective deterrent. Another more exotic possibility is providing a number fixed underwater electrical supply points they could attach to, extending underwater time – though stationary. A big advantage of this idea is that we could get back into the U.S. Trident submarine replacement cycle in a further 10 or so years, so would not have to risk building replacement subs ahead of the U.S. finalising thier new designs. Also it could be mixed with some full capability SSBNs until the last one hits 30 years age in 2029. And of course it is more in line with Article VI requirements than building replacement submarines. major lemon – let’s hope that’s never an issue! i read recently about the whole sealed orders in the captains safe onboard, should the uk be destroyed, basically gave him the choice of whether to launch a retaliation, or to sod it and find a safe haven for the crew (think canada was the first choice). as for current subs, think its to do with the reactor lifetimes as rwendland notes, however think its more unavoidable than switching them off and running on the diesel – there are many safety considerations / laws about their use and decommissioning, you can’t be sailing around with a 30 year old reactor that might be falling apart … also the whole point of nuclear is the fact you don’t need to surface for the entire tour, i’m not sure if you can do that with diesels – by not surfacing in arctic waters you are hopefully staying hidden and preserving the deterrent effect. not sure why we would necessarily want to tie in with the usa sub designs, other than for missile lifetimes; from the work on the astute class in the uk the new ssbns would be designed so they would not need to be refuelled over the 25 year lifetime (current ones have one mid-life refuel) – the only concern would be new us subs moving to a different missile system etc, otherwise it shouldn’t matter on the specifics of the design? In this wonderful analysis, I do not really get an answer to the basic question: Who would attack Britain with nuclear weapons and why? Only then can you get on with the issue of deterrence and its effectiveness. It is my understanding that the submarine design community in the UK has atrophied to the extent that the heavy lifting associating with designing the next CASD platform will fall to US entities. This is good from an industrial capability perspective from the US as the aging design workforce needs to be employed now, and this effort combined with human capital investment by adding additional relatively inexperienced engineers to successfully execute the UK design will allow the engineering design base in the US to gain the necessary experience to execute the upcoming US design (2020 timeframe?) to replace the Ohio class. The desire to design a new CASD platform is certainly not a simple decision, but this may be an under-recognized driving factor. The US and the UK would then retain the cooperative capability to actually complete these designs for both the UK and the US CASD platforms. Once the design capability is lost (as I believe the UK is experiencing now) it is a long climb back to establish that capability anew from whole cloth. OT, but it looks like Russia buying those nukes out from Georgia was a good plan..
Yeah, I concur with the anonymous poster. I think you neglect the survivability issue. 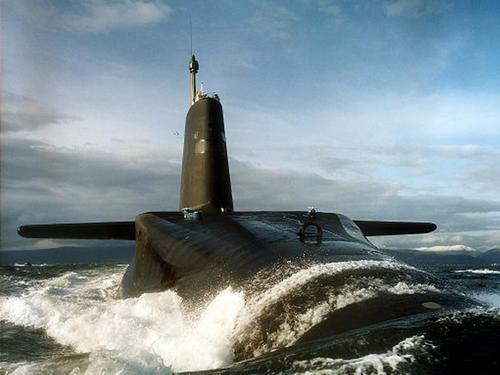 What makes submarines such attractive platforms is their survivability. I agree that CASD missions are great training, but they also enhance the credibility of the deterrent. Maybe the question goes back to what you think deters? Certainty or uncertainty? Kahn or Schelling? At the rate supersonic cruise missiles are advancing, what about putting the deterrent on cruise missiles launched from torpedo tubes? That will give the SSNs something more to do. The UK nukes deter Argies, regardless of what they attack the UK with. Let’s not forget that the government’s arguments were marshalled for the sole purpose of renewing the Trident system as it is currently configured for reasons that have a lot to do with Britain’s self-identity as a major, interventionist power, as a nuclear weapon state, as no. 1 ally of the US and for Labour an identity as being strong on defence (and not leaving the French as the only nuclear power in Europe) and much less to do with formal deterrence rationales. Nevertheless, a host of questionable ‘strategic’ arguments are presented, including the ‘need’ for CASD, for a nuclear delivery capability of global reach, and to provide a second-centre of nuclear decision-making in NATO. These arguments need to be picked apart and the case for nuclear ‘business as usual’ to mid-century reconsidered. The U.K. nuclear forces are foremost a symbolic force. It does not really matter, whether one boat is at sea or not. For Pete’s sake, Mr. Acton. A Cambridge physicist should know enough logic to understand that ‘existential deterrence’ is of no relevance in the case of China or Russia. With regard to the original post, I interpreted as meaning that survivability is besides the point: it’s the ambiguity that maintains the deterrence value. Assuming that an adversary can’t actually observe how many subs have been destroyed by a first-strike, they would be forced to factor in – with some probability – the likelihood that one remains, and that it’s sealed instructions from the PM specify a retaliatory strike (or that communication links remain and a second strike will be authorized). And as for the existential argument, the mere possibility of a sub surviving would concentrate the mind wonderfully. On that line of argument, I’ve always wondered why it wouldn’t be possible to replace all you warheads with bags of sand and paper cut outs, and just pretend you’re practicing CASD without bearing the cost, occasionally getting some subs to surface and look busy. @ sealed orders: How would a surviving SSBN know against whom to launch? Hmm?? Just assuming, because yesterday evening tensions were high? Or like a nuke on Moscow is never a bad idea? Practically, a launch from a surviving SSBN to get even with ….. (fill in) would have to rely on external verification of who launched first. A quasi automated “sealed launch order” akin to a dead hand is not really practical. It also applies incidentally to space weaponry: you can’t fight blind! There’s a simple organisational trap here: if you make the patrols a) intermittent and b) highly classified, it will be tempting to nibble at the schedule to save money, from 75% to 50% and so on. Um… is there any need to ask again who the UK boats deter in light of the events in Georgia?